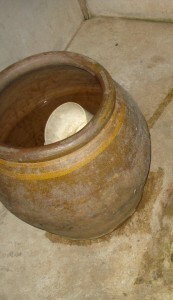 Above is a big earthenware pot filled with water that has a small pot floating inside it. This can be found everywhere outside the tourist areas but it is only half the picture…it goes with something else. What is it? If you’ve been to Thailand or South East Asia for that matter you know exactly what it is so give the ones that haven’t a chance. First one with the right answer will get a little link love and possibly more. Petra from Blooms and Blossoms nailed it. It is in fact the flushing mechanism for a squat toilet…and if you notice there isn’t any toilet paper either so you have to use it to clean yourself too. Check out Petr’s blog she takes absolutely beautiful pictures of flowers. To wash up after going to the bathroom in a weird Asian toilet. Probably some sort of thing you have to squat over. You are right of course, we do know the answer, but I like the idea of the quiz. Just one observation……the floor looks amazingly dry, safe to drop your shorts? have a nice day. Errr… it goes with a source of water…? ‘Coz I can’t imagine running out when you need it most hahaha. Flishas last blog post..Notice Anything Different in The Address Bar? Pardon my ignorance but it this something for someone to wash their hands or feet before entering a place or something?? I have no idea..just a wild guess. The toilet is missing. Honestly I hated these kinds of “bathrooms” - but that’s still better than using the reguar ones which were often very dirty because people use them the same way as the flat ones in the floor…. 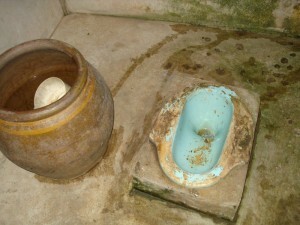 So it’s like a Thai bidet? Seems…uh…insufficient. What did I not answer the question correctly enough for you? I protest!